Almost a quarter of North Dakota’s 2016 vehicle crashes happened due to failure to control speed. Reveal vehicle problems NOW using the North Dakota free license plate lookup. Moreover, the state’s Department of Transportation can also be requested for information about North Dakota-registered cars. If you have inquiries, you may ask questions online or contact the agency through its Information Desk at 701-328-2500. For further assistance, visit the Contact Us page. Residents need to fill out the application form to register and title a vehicle. Depending on your need, you may also get either the Drive Out permit or the Temporary License permit. The Drive Out permit, which can last up to 30 days, is recommended for non-residents wishing to get their newly purchased cars out of the state. For non-resident workers of the state, they may use the Temporary License permit to drive their cars in the state within 6 – 12 months. The North Dakota Department of Transportation is the main provider of license plates for vehicles registered in the state. For the state’s passenger cars, a standard serial format containing three letters and three numerical digits is usually applied. The state requires two license plates for each vehicle unit. For a fee, a replacement order can be requested for a missing/damaged decal or plate. Read the FAQ Duplicate Registration document for more information. There are five (5) plate styles that you may choose for your vehicle unit in North Dakota. Fill out the Personalized/Special Plate Request Form to get a personalized/special license plate. Once the ownership of a vehicle is transferred to another person, the former owner’s plate becomes invalid for the vehicle and should be removed. The new owner must apply for another vehicle registration to get a new set of license plates. Your plates can only be transferred between your own vehicles. Visit the Plate with Owner Regulations page for more information. As stated in the “North Dakota License Plates & Placards,” the applicant must complete the title form to begin the title application. The registered owner can use the same form to request a duplicate title as well. If a lien is still binding on a car, the duplicate title may go to the lienholder. To avoid this, the applicant must secure the lienholder’s permission to relinquish the lien, by declaring the intent on the release form. This will ensure that the duplicate title will be received by the registered owner. As required for most vehicles, the applicant must prepare to show the latest odometer reading of the vehicle being titled. If the vehicle being transferred has sustained serious damages in the past, the owner must complete a disclosure form upon transferring the ownership. Keep in mind the conditions specified on the form. Not all damages are required for disclosure. If you haven’t found the information you are looking for, you may visit the Frequently Asked Questions page for North Dakota title and registration. You may also ask the agency directly for other details unavailable from any source. Buying a used car in North Dakota? Don’t make a costly mistake. 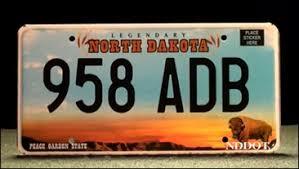 Run a Free License Plate Lookup for your North Dakota-registered vehicle! Run a Free North Dakota License Plate Lookup to uncover the full-story of your North Dakota-registered vehicle.